You’ll hear it this week (if you haven’t heard it already): Chinese New Year is coming up, so it’s going to be cold! I'm just starting on this, so I'll jot down notes as I go along. There are three options for starting a company in Hong Kong: a sole proprietor, a limited partnership, or a limited liability company (LLC). Oh warm and fertile Spring, new growth bursting out all around. Which in our flat means mouldy ceilings. The theme of my first Hong Kong climate change article was simple: average yearly temperatures here have been going up more less steadily since the Hong Kong Observatory (HKO) starting keeping track of them, but they have skyrocketed in recent decades. Yet over the past 60 years, essentially all of this warming has occurred at night, i.e. In particular, where do you go to buy TVs, cameras, computers, mobile phones, etc? Our suggestions about this on batgung are around six years old. Then we wrote about visiting small stores to get a good deal, but these days I find I'm more likely to go to the big chain stores, especially if shopping with visitors. I feel the difference in price between them has got much smaller - or maybe I've just got more cranky, and can't be bothered visiting lots of shops. So, cranky or rational - that's the question I hope you'll help answer. 20 Oct 1989. 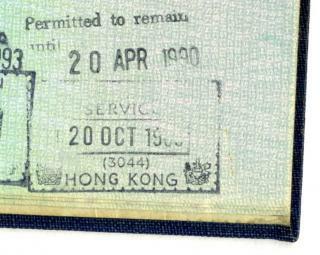 That's the first Hong Kong stamp in my passport. Twenty years already? That's gone past quickly. Will I be here for another twenty? Our younger daughter is only three, and we want her to grow up reading and writing Chinese. That means another ten years at least. Then even if we did move, where would we go?